This law went into effect last January and provides paid leave to employees for a family member’s serious medical condition or to bond with a newborn child. This year, time off and reimbursement rates are rising for employees. Qualified employees may be entitled to up to 10 weeks of paid leave and 55% of their salary, depending upon how much they earn. These figures will rise again in 2020 and 2021. For more information on the 2019 benefits, visit New York State’s website. Although the payments are not made by the employer (in fact the employer pays nothing to the employee for the paid leave), employers must still be aware that they cannot discriminate against an employee for taking a permitted leave of absence. An employer that terminates an employee while on or immediately after they take paid leave could face a discrimination claim. Effective January 1, 2019, minimum wage for all New York State employees has increased. In New York City, employers with 11 or more employees must pay their employees a minimum of $15.00 per hour. New York City employers with 10 or less employees must pay a minimum wage of $13.50 per hour. On Long Island and in Westchester counties, minimum wage has been increased to $12.00 per hour. Everywhere else in New York State, minimum wage has increased to $11.10 per hour. Applicable time and a half rules still apply for overtime compensation for all employees. Hospitality workers who receive a “tip credit” must be aware of changes to the tip credit minimum wage. In addition to being required to meet the “duties” test to be considered an exempt employee (and not required to be paid for overtime), the salary threshold for employee wages has also increased. In New York City, employees must earn between $1,012.50 and $1,125.00 per week depending on the company’s size. On Long Island and Westchester, the figure is $900.00 per week. Throughout the rest of the State, the minimum salary is $832.00 per week. If an employee does not meet this minimum threshold, he/she cannot be considered an exempt employee, and is entitled to be paid overtime compensation. 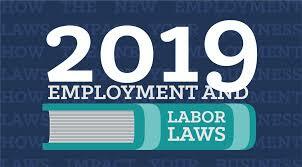 Effective June 30, 2019, employers in Suffolk County can no longer make an inquiry into a job applicant’s wage or salary history, including but not limited to, compensation and benefits. Employers also cannot rely on the salary history of an applicant in determining his/her wage or salary amount at any stage in the employment process, including at offer or contract. The law also prohibits employers from searching public records or databases in an effort to determine an applicant’s salary history. The law applies to any employer with four or more employees.